If you receive a "login failed" message when launching Thunderbird, it may mean it's saving your password for you. After changing your password, you must stop your email program from saving the old password so that you can enter the new one. Click Tools > Options > Security > Passwords tab. Click the Saved Passwords button. 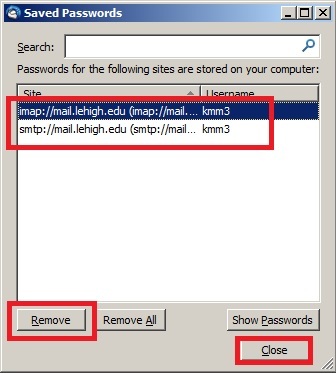 Select the mail server name(s) where you want to remove password saving. Click Remove for each one. Click Close when finished.